Contrary to Apple’s minimalistic design choices, I see a massive flow of cheap and usually ugly trash accessories like a large variety of cases, color headphones or earphones, keyboards, cables etc… those generic mass-produced items that are available in the market. Fortunately, there are notable exceptions like the BookBook cases by Twelve South. Now these are certainly not accessories for purists mad about minimalism, on whose pure crystal-clear desks (with no coffee cup marks, of course!) there is almost nothing that is not absolutely necessary. I think they will be appreciated by people who like old stuff, antiques, especially old books. The MacBook or iPad made of cold, impersonal anodized aluminum will be hidden in a big bound volume with a leather finish. 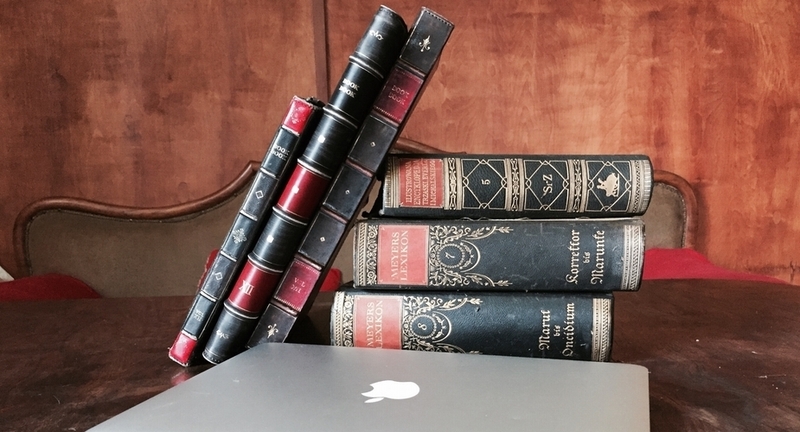 Contrary to many MacBook and iPad covers of purely utilitarian function, that have to look nice and inexpressive, BookBook cases smell of leather and are eye-catching. They look like an old treasured book that is taken with care from the library shelf. BookBook covers are antonyms of minimalism. They are works of art enclosing a utilitarian product that is also another work of art - that MacBook or iPad. Putting BookBook covers side by side with a collection of old books makes them hard to distinguish at first sight. Both the front and back of each case, as well as spine of the cover, are finished with fine leather typical of old books with an embossed spine and printed name. BookBook covers look as vintage as the late 19th and early 20th century books from my library. There are two versions of finish used with the BookBook covers. One of them is a matte finish that will get more scratches and stains over months of use, making it appear even more vintage. The other finish uses a glossy colorless paint that more scratch proof. The only piece of the cover that reveals its modern provenance is a zipper. However, it is not easily visible, mostly because of the color of the fabric resembles the color of old paper pages. The slider heads and pull tabs are equipped with leather straps for easier opening or closing. Opposed to the minimalistic, inexpressive covers that are usually put aside after drawing the Mac or iPad out of a bag, BookBook covers are created to tantalize a user's senses not only while they’re being carried, but also while you’re working with the electronic device inside them. There’s a kind of symbolic meaning in the connection between the BookBook cover and the computer. The personal computer and tablet made classic printed or handwritten books obsolete in many ways, taking over their function — you only need to open a text editor to write on its blank pages. The inside of each BookBook cover is lined with velvet and thanks to that, both MacBooks and iPads are protected from scratches. For the MacBook covers, there are small ribbons that go over the top corners of the display. Thanks to those, the MacBook is stable in the cover, even when fully opened. The design of the inside of the BookBook for iPad is a bit different. There is a special leather envelope into which the device slides. The case also tilts the iPad slightly to make it easier and more comfortable to use. Are there any disadvantages of the BookBook? That’s a hard question to answer. Their specific form determines their functionality and features, some of which can considered both as pros and cons. They’re heavier and bulkier than other cases or covers made of plastics or artificial fabrics. Using a BookBook on daily basis, you will have to accept the fact that it needs more space in the bag or on your desktop than your uncovered MacBook or iPad. BookBooks are not mere mass-market accessories for everybody, but rather for lovers of classic design and workmanship.